That I found Discourse Coffee is entirely down to a tip-off from Dan of Uncommon Grounds Specialty Roaster in Appleton. Without that knowledge, I never would have stumbled across it. Even then, despite knowing that it was there, the actual coffee shop took some finding. 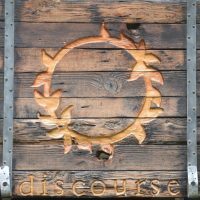 Discourse is in the Country Walk Drive mall in Sister Bay, a delightful lakeside town on the western (Green Bay) side of the Door County peninsular. The mall consists of a large parking lot, with a supermarket to the right, plus two rows of shops which look rather like a terraced cabins, one on the left, the other at the back. Start here, but rather than heading to one of the shops facing the parking lot, instead go around either side, where you’ll find steps leading down to a second row of shops facing the first across an open, grassy space with several large trees. Ignoring those, turn back on yourself to face the car park where you’ll find a two-tiered row of shops, behind the shops bordering the car park. Here, roughly in the middle of the bottom row, is Discourse, given away by its prominent sign and a row of three comfy chairs to the left of the door. This slightly subterranean location gives Discourse a cosy, basement-like feel, aided by a low ceiling, although there is a pair of windows to the left of the door. The left-hand side of Discourse is mostly seating, while the right’s the domain of the counter, although it’s set back a little, leaving space for a narrow three-person bar against the front wall, to the right of the door, seating provided by comfortable, swivelling bar chairs. Four more of these chairs line the left-hand side of the counter, an amazing, wooden affair, while the rest of seating is off to the left. There’s a six-person communal table at the front, then, at the back, a massive, two-piece red couch runs along the left-hand wall, faced by two blue armchairs across a low coffee table. The coffee, however, is the main draw. Milwaukee’s Pilcrow Coffee acts as the house-roaster, with its Storyteller blend on espresso and pour-over, where it’s joined by three single-origins from various roasters. The coffees are changed on a weekly basis, with the guest roaster changing every month. There’s also a rotating option on batch-brew. I started off with a cortado, the Storyteller going really well with milk, to produce a rich, biscuit-like flavour. After Ryan and I got chatting, he made me a shot of a washed Ethiopian Sidamo from Pilcrow, served in an hourglass shaped pottery cup on a Door Country slate tray, with a horn spoon. This was a touch too acidic for my tastes, although not unpleasantly so. However, before I could finish it, Ryan produced a cylindrical pottery cup which he transferred the rest of the espresso into. This had an immediate impact on the flavour, accentuating the sweetness, producing a much more favourable impression on me! By now it was well past closing time, but Ryan insisted on making me a Moonwater Latte. This is one of Discourse’s signature drinks, in this case a latte with honey, cinnamon, pepper and Applewood smoked sea salt. The Moonwater is always on the menu, but the other drinks regularly change, with two new drinks coming on the menu each week. Regular readers will know that this is absolutely not my thing, but even I had to admit that it was lovely, less coffee and more dessert in a cup, a delightfully smooth, sweet drink offset with the touch of cinnamon. Divine. December 2018: Discourse Coffee has won the 2018 Most Passionate About Coffee Award. This entry was posted in Basements, Cake, Coffee Shops, Laptop Friendly, Sister Bay and tagged include, Midwest2018, Pilcrow by Brian Williams. Bookmark the permalink.